On Sunday, severe thunderstorms and heavy rain will once again be a concern for the Baton Rouge area. With many outdoor events scheduled, please stay in touch with the forecast and have access to alerts, should any be issued. A strong upper level trough and surface low pressure system will swing out of the Lower Midwest toward the central Gulf Coast. With temperatures in the upper 70s and high dew points (humidity) for early April, the atmosphere will be very unstable. Enough shear will be present to turn storms severe and enough deep moisture will allow for heavy rainfall. The National Weather Service Storm Prediction Center has broad brushed all of Louisiana and most of Mississippi with a two out of five, “slight risk” for severe thunderstorms. This means that within the outlook area, scattered severe thunderstorms are possible. Statistically, there is a 15 percent chance of experiencing a severe thunderstorm within 25 miles of any given point in the outlook area. The main threats from any severe thunderstorms will be damaging wind gusts and possibly isolated tornado or pocket of hail. The most likely timeframe for storms to turn severe will be late Sunday afternoon and evening. The National Weather Service Weather Prediction Center is forecasting 1.5 to 2.5 inches of rain for the WBRZ Weather forecast area. 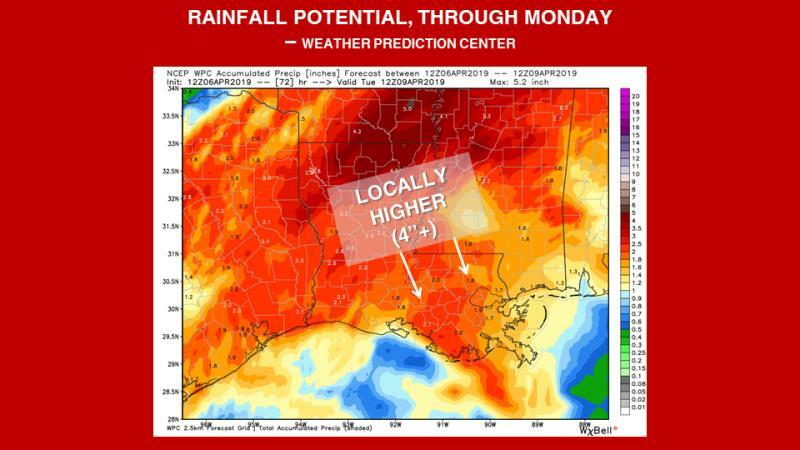 However, Gulf Coast states like Louisiana and Mississippi are very prone to locally heavy rainfall and isolated amount in excess of 4 inches may occur, similar to last Thursday. The local National Weather Service office in Slidell may issue a Flash Flood Watch to account for this since grounds remain saturated from the most recent event. The threat for strong storms and downpours may extend into Monday as well. Much quieter and warm weather is expected Tuesday through Thursday of next week. 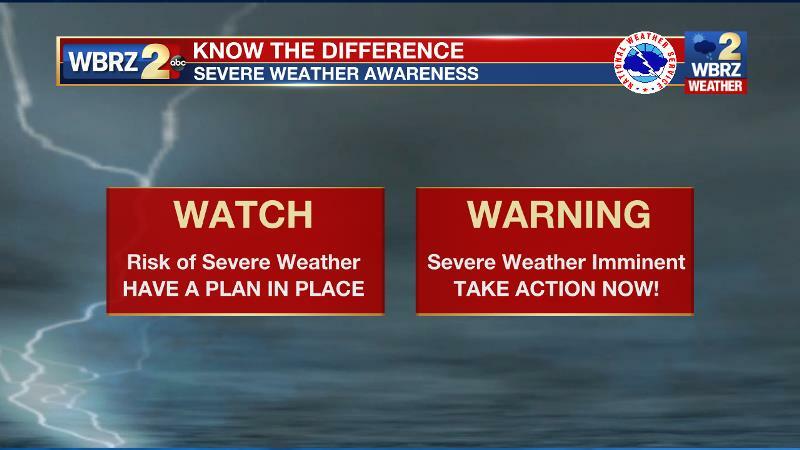 Don’t be scared, be prepared: This is the spring severe weather season and events like this are expected a few times each year. Stay in touch with the forecast this weekend, know your severe weather plan and have a way to receive alerts. Never rely on an outdoor warning siren; if that is your main way of hearing warnings, you have little hope of hearing them indoors. Have a NOAA Weather Radio in your home or business, and activate the free WBRZ WX App. on your Apple or Android device. Identify the safest place in your home. Often a small room, on the lowest floor, away from windows, near the center of the house is your best option. If you live in a mobile home, you should leave and go to a sturdy structure when a watch is issued. Wear hard sole shoes into your safe place and cover your head until the threat passes. Also, leash up your pets and bring them along so you are not separated.